The LMS has been a hot discussion topic for some time now. There have been posts discussing its survival and a few posts before that discussing its future – Jane Hart posted what is the future of the lms reviewing useful of LMS, followed up by a similar post by Harold Jarche suggesting LMS is no longer the centre of the universe. Clark Quinn brought in a little balance by highlighting what the LMS could be used for and to what extent in his post – a case for the LMS. I wanted to do a quick SWOT analysis of the LMS to get some understanding on the LMS scenario today. Around for quite some time now and is well accepted. Provide a central and manageable system for both online and offline training. Capable of integrating with the workflow. Capable of integrating with other existing HRMS/IS. Works excellent for course management, delivery and tracking of formal learning. Some LMS systems are capable of managing more than only eLearning – competency and talent management (though limited). Most LMS systems not ready for Web 2.0 experience and still offer outdated way of course access. Still focused on formal learning to be pushed to learners. Course-centric workflows and approach is inherent. Varied and fragmented suppliers pool with differing technical and functional capabilities. Overall customer experience with LMS is not consistent. Social and Informal learning trends. A real opportunity for LMS to create learner-centric environments rather than centralized course delivery system. By not only providing the tools but also revamping the whole learner experience is required. Talent management. Given the core strength of the LMS and its capability to link with other systems, being able to offer talent management functionality in the context of both formal and informal learning is an excellent opportunity for the LMS to become and remain relevant for the HR/training function. Slow to respond to changing learner needs. Fragmented market. With the suppliers fragmented across verticals, focus areas, technical capabilities only a few LMS systems respond to the changing dynamics of the market. More LMS systems out of tune to the market demands will create a higher level of dissonance with the LMS as a whole in terms of its relevance and usefulness. Social networking tools. Tools focused on providing a networked environment to learners and allowing them to share content, opinions and information with each other could extend to take over some of the LMS functionality posing a new competition (already are) to LMS. Though there are clear and actionable weaknesses and threats the LMS faces today, there are also a set of opportunities that the LMS should avail of and continue to remain relevant for the target audience. 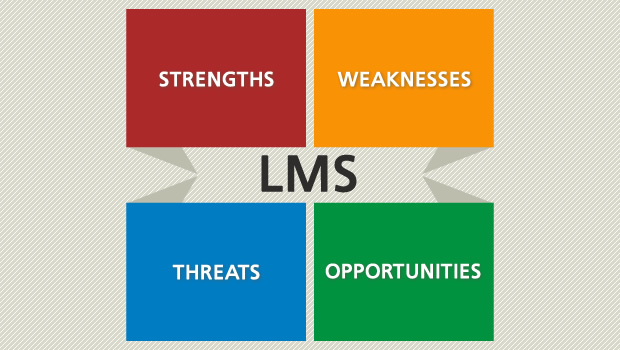 Amit thanks for the valuable content… I request you if u can focus more on the SWOT for LMS’ for Educational Institutions. @Sai, you should check the PDF in the comment posted by @Sheila. It has valuable pointers in that direction and how they have addressed weaknesses. The PDF contains information very relevant to LMS for Educational Institutions (and in general too). Amit, Thankyou.. Thanks Sheila.. It would also be great if we could discuss about the scenario that pertains to the Indian Educational System.